Original 8N 3″ x 19″ front wheel. 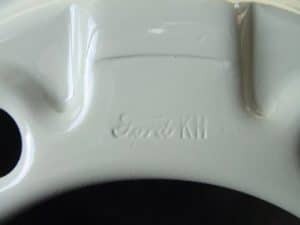 In rare cases the Ford script and KH (Kelsey Hayes) markings can be found on these wheels. Original 8N 16 inch front wheels. 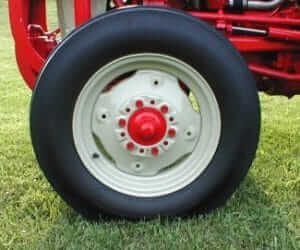 The 19″ front wheels were standard equipment and the 16″ wheels were optional, intended mainly for tractors with loaders. 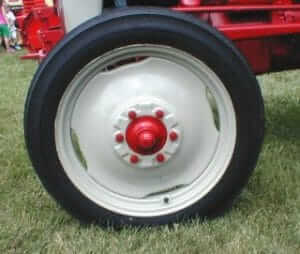 The wheel on the left is the more rare 16″ early 8N wheel used until 1950. Note the lack of mounting holes for wheel weights. The wheel on the right was used in 1951 and up. 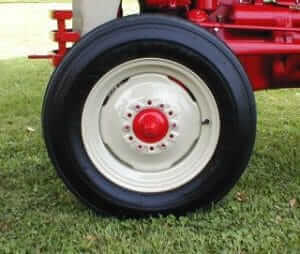 It’s a standard implement type wheel still readily available today.